The second quarter of 2015 concludes with the total of 296 million domain name registrations across all top-level domains, as reported in the Domain Name Industry Brief prepared by Verisign. Over the period of one year, the number of all registrations has gone up by 16.4 million, or 5.9 percent. 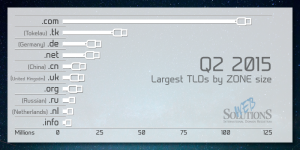 The closing of the second quarter was marked by an increase in the number of domain name registrations across all TLDs by 2.2 million in comparison to the first quarter of the year. That is a growth of 8 percent. Registrations within country-code TLDs (ccTLDs) have been growing steadily over the year, showing an increase of 8.2 percent with the total number of 138 million domain names registered at the end of the second quarter. Within a period of a year, the number of registrations within ccTLDs has increased by 9.1 million. 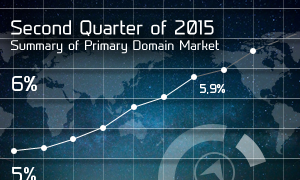 The percentage of year over year growth of the ccTLD segment was 4.8 percent. The .com and .net TLDs combined experienced continual growth of 3.1 percent year on year, reaching the total of about 133.5 million domain names in the second quarter of 2015. At that time, the base of domain names registered under .com amounted to 118.5 million, while that of .net equalled 15 million domain names. 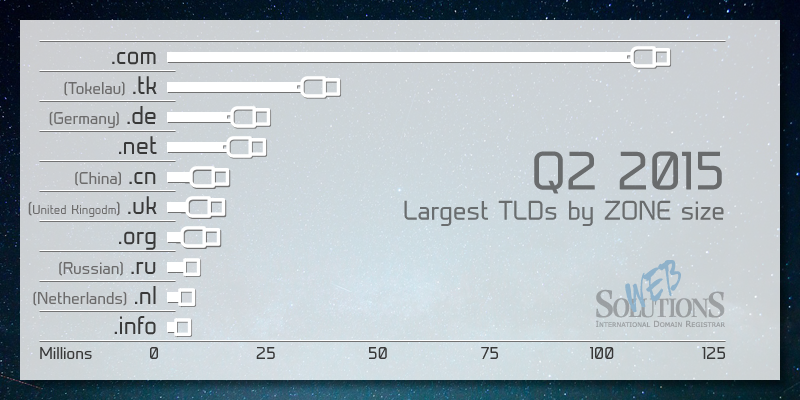 The unquestioned leader among all top-level domains in the order of zone continues to be the .com domain, followed by ccTLDs: .TK (Tokelau) and .DE (Germany). The Chinese domain .CN shows a dynamic growth that corresponds to the economic development of the country. The Report also points to the growth of .com and .net domains redirecting to well-known social media and e-commerce websites, comparing the first two quarters of 2015. It shows an increase of 16 percent in redirection to LINKEDIN, 13 percent to FACEBOOK, 11 percent to ETSY, and 7 percent to TUMBLR. Domain names registered within new generic TLDs (ngTLDs), according to the report, constitute 2% of total domain name registrations. 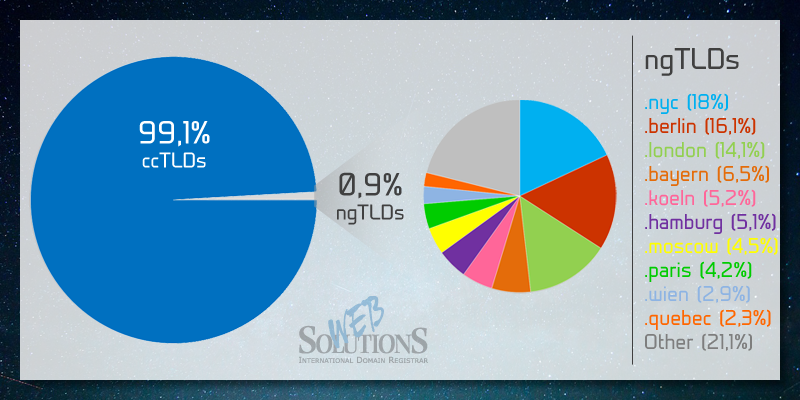 As of June 30, 2015, there were 5,86 million names registered under ngTLDs. The .xyz domain continues to lead the way with the Chinese IDN .网址 (xn--ses554g) in the second place and .science in the third position. On the other hand, geographical ngTLDs that have so far been released constituted 0.9 percent of total domain name registrations (444,758 domain names) at the end of the second quarter. Twenty-eight of them reported more than 1,000 registrations since entering the general availability (GA) phase. The 10 highest ranking geo ngTLDs are presented in the chart below with .nyc, .berlin, and .london topping the list in the percentage of registered domain names. 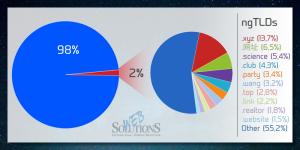 The above facts present a picture of a dynamic growth in the domain market globally. The introduction of new gTLDs and geo ngTLDs has triggered new trends and opened doors to more naming opportunities. On the other hand, the well-established and time-tested legacy TLDs such as .com or .net continue to make up the bulk of all registrations. If you wish to know more about any particular domain, please select the domain from our list. If you need assistance, do not hesitate to contact us at support@web-solutions.eu or via phone on +44 (0) 208 133 3994.